As promised, we're going to visit the Asian galleries at the Royal Ontario Museum (ROM) one by one. First up, by special request of a loyal reader in Malaysia, is the Bishop White Gallery of Chinese Temple Art. Actually, there's so much to cover in this gallery that this will be just Part 1 of 3. 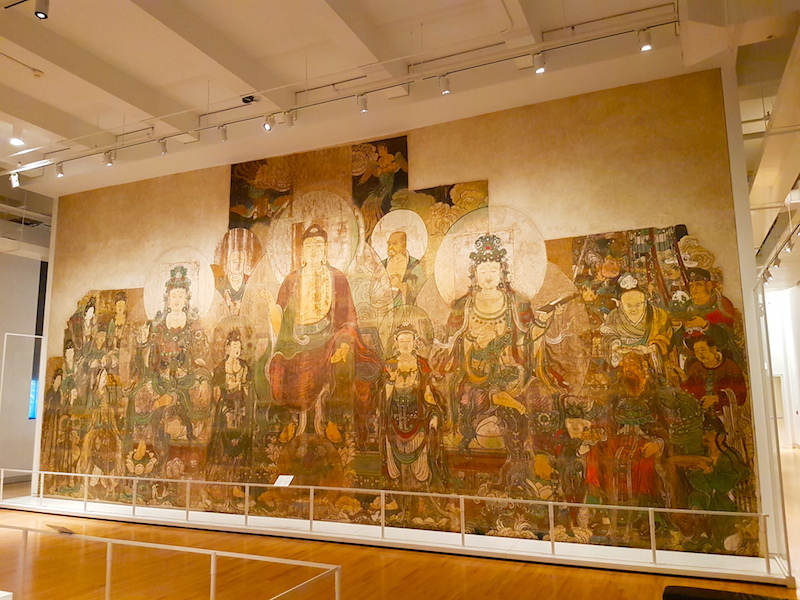 We'll start with the gallery's monumental temple mural, The Paradise of the Maitreya (see below). 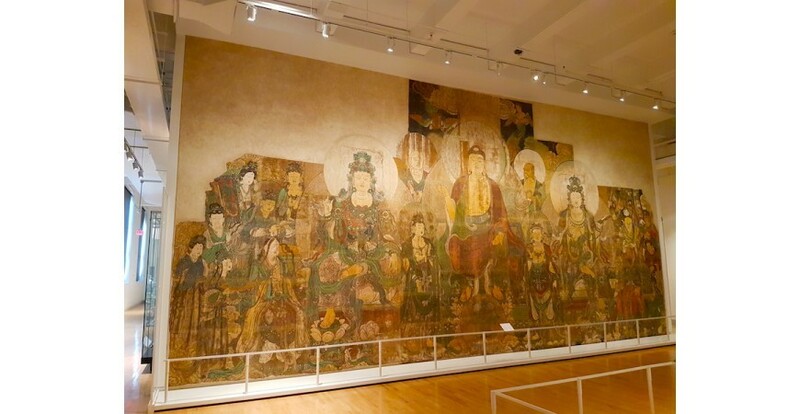 According to the museum's data as given in its online image archive, the mural is slightly over 5m high at centre and a little over 10 metes long. I almost wish that someone were standing in front of it in the photo below, just to give a sense of the scale. As it was, I was happy to get a people-free shot. Pro-tip: Go on a Monday morning to avoid the crowds! This large-scale mural on clay was painted in 1298 on a wall at the Xinghua Monastery in China's Shanxi province. This monastery no longer exists. Bishop White, the Anglican missionary to China after whom this gallery is named, had it removed and shipped to Toronto during the warlord era between the collapse of the Qing dynasty and the Pacific War. The museum claims that the monks themselves negotiated the sale of the mural because they feared for its future in those troubled times. Since the monastery is gone, their fear seems to have been justified. Remarkably, the names of the artists are known: Zhu Haogu and Zhang Boyuan. I say 'remarkably' because many of the artists who worked in Buddhist temples did so anonymously. I'd love to know why and how the names of these two artists have come down to us. The date places this work squarely in the period of the Yuan, i.e. the Mongol dynasty. Fans of the current Netflix series Marco Polo will know that the dynasty was founded in 1271, when the Great Khan of the Mongols, Kubhlai Khan, conquered the Southern Sung and proclaimed the Great Yuan. 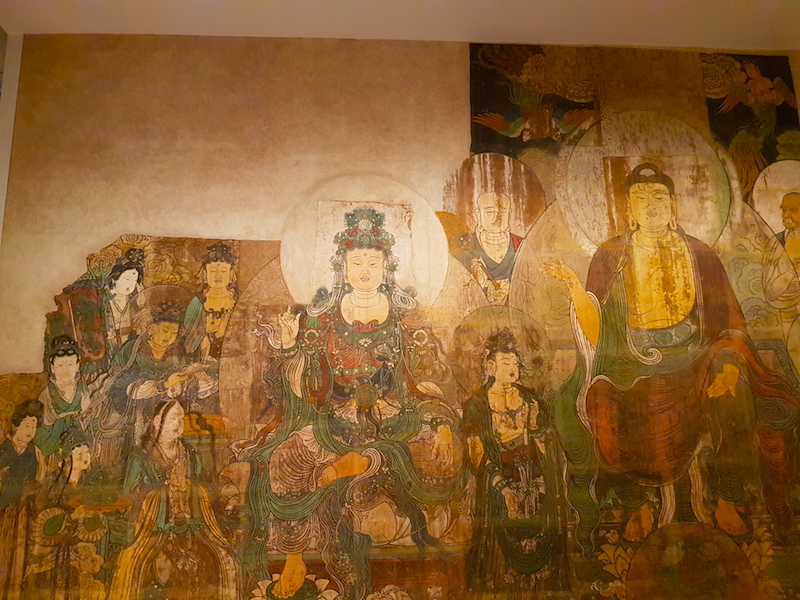 The Mongol emperors encouraged all religions, but Buddhism in particular prospered under their rule, which at least partly explains the creation of monumental works such as this one. Maitreya, the Buddha of the Future, symbolizes the hope for spiritual redemption. 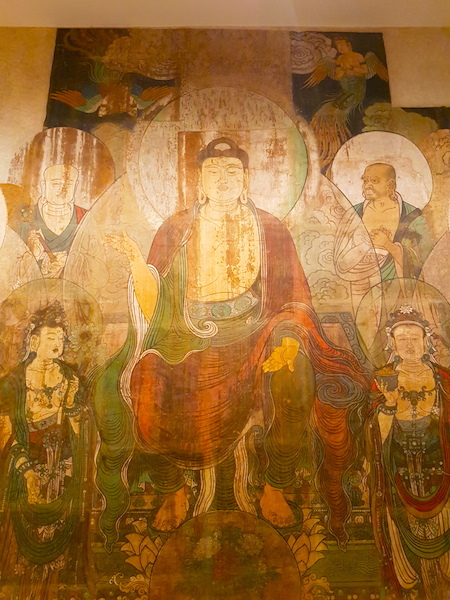 Here he is depicted delivering a sermon in the company of bodhisattvas and disciples. King Sankha and Queen Syamavati of the Kingdom of Ketumati, where Maitreye will be reborn, heed his call and set an example for others to follow. They are seen sitting to the right and left, and are having their heads shaved to signify their conversion to Buddhism as well as their willingness to renounce their worldly status and riches. The Maitreya was and is very popular in East Asian Buddhism. There are literally thousands of representations of him around the region. In Korea he is known as Mireuk Bul. I don't know his Japanese name, but perhaps someone in the know can leave a comment. Of course, as the main figure in this mural, he is placed at centre (see below). He is flanked at the knee by a pair of bodhisattvas. The information on site does not identify them. If anyone can identify them or the other figures, again, please comment. 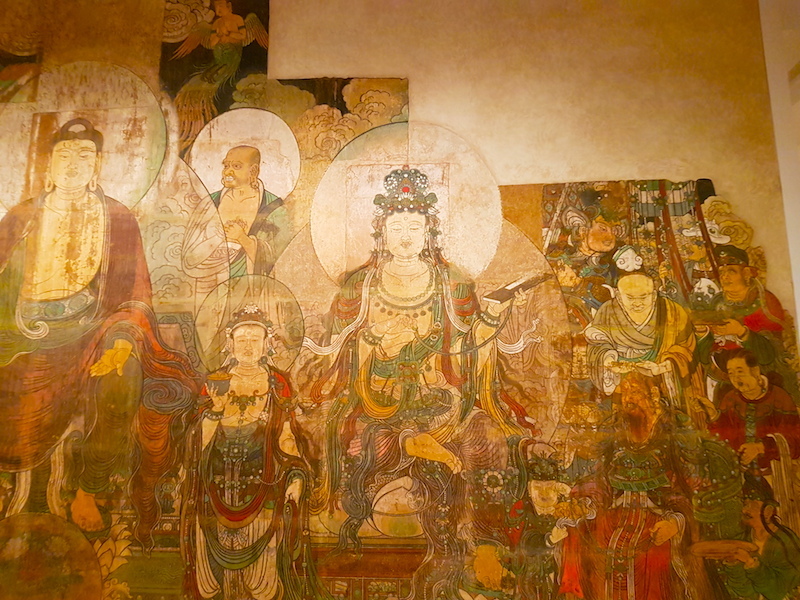 On the right side of the mural, I assume the central figure is Avalokitesvara (see below). I say that because in my experience the figure on the right side of triad often is. If anyone knows better, please comment. King Sankha of Ketumani is at bottom right. On the left side of the mural, I'm not sure who the central figure is (see below). As a Theravada enthusiast, I'm not versed enough to identify all the Mahayana deities. Once again, if anyone knows, please comment. Queen Syamavati can be seen at bottom left surrounded by her ladies. As I mentioned at the top, there will be 2 further parts to this exploration of the Bishop White gallery. I feel the need to get a few more pictures, so Parts 2 and 3 may not appear until after my next visit to Toronto in December. As always, you can comment below, on the Lotus & Persimmon Facebook page, or on the Lotus & Persimmon Instagram account. The Chinese porcelain production process, illustrated in gouaches. The L&P gallery is re-organized in the wake of the summer market season. L&P examines the map of the Chinese Empire in the 1858 edition of Morse's School Geography. L&P inspects a handsome Portuguese-built colonial building in Macau, the Leal Senado. L&P visits the China, Japan, and Korea galleries in Mexico City's National Museum of Cultures.